Last week we wrote about ways that you could easily and affordably refresh your living space for Spring. Next on our spring style revamp list: your table! 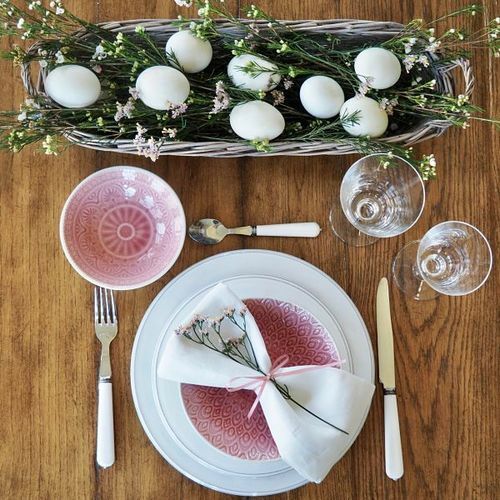 Whether you're hosting a fancy Easter dinner or just having a casual family get together, we have a few tips on how to keep your dinner table looking fresh and inviting this Spring. Brightly colored bowls will liven up any table setting this Spring. Pick and choose some of your favorite colors and patterns and use them to brighten up your year round dinnerware. Bowls are a great statement piece when it comes to your table because they serve so many different purposes, whether it be at breakfast, or simply as a spring decor accent. These Marble Effect Bowls from House Doctor are our current favorites! Table linens are essential for setting the right tone to your event and they can really transform a space. This spring, opt for lighter colors and smaller patters in your table linens, these will offer a more airy and natural look to your table and will effortlessly tie together your table setting. These stunning block-print, cotton tablecloths by Bungalow will add personality to any table. The original patterns combine clean Danish design with rich colors, creating the perfect canvas for a beautiful table. Setting your table with the right glassware is like choosing the right jewelry for an outfit. The glasses will express your personal style, but they’ll also establish the tone and mood of your event. These simple yet elegant wine glasses by Côté Table will add style to any table. The subtle optic adds a modern and airy twist to the classic tulip design. Keeping your dinnerware classic and neutral will allow you to have more flexibility when it comes to dressing up or down your table for any event. Sticking with a neutral palette will allow you to change accent pieces and table linens to suit the season or occasion. Be sure to shop the rest of our Kitchen & Dining Collection for more spring decor inspiration!